My aunt and uncle joined me for Sunday’s game and we left their house at 11:15. 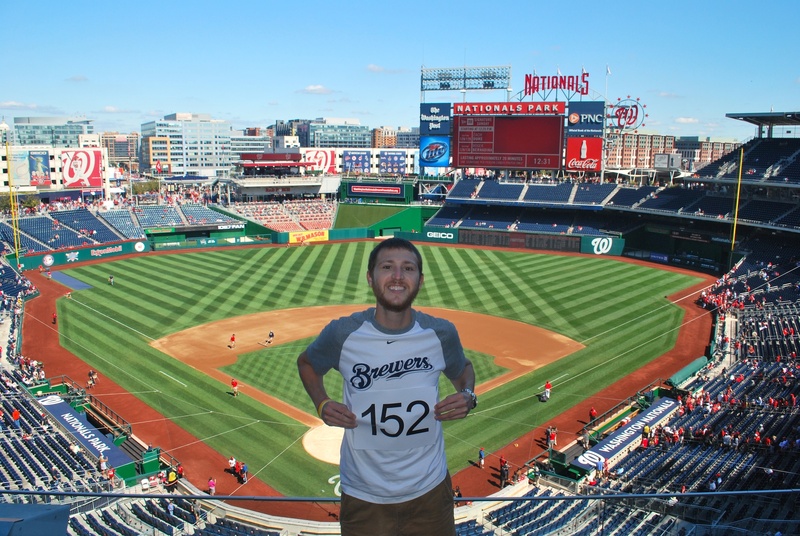 We drove down to Nationals Park and were at the player will call window by 12:20. After getting my ticket we went inside and made our way to the upper deck. My uncle Jon did the honors for game photo number 152. The capitol building is partially visible on the far left. After getting the picture taken we went down the ramp in the right field corner to get to the second level. 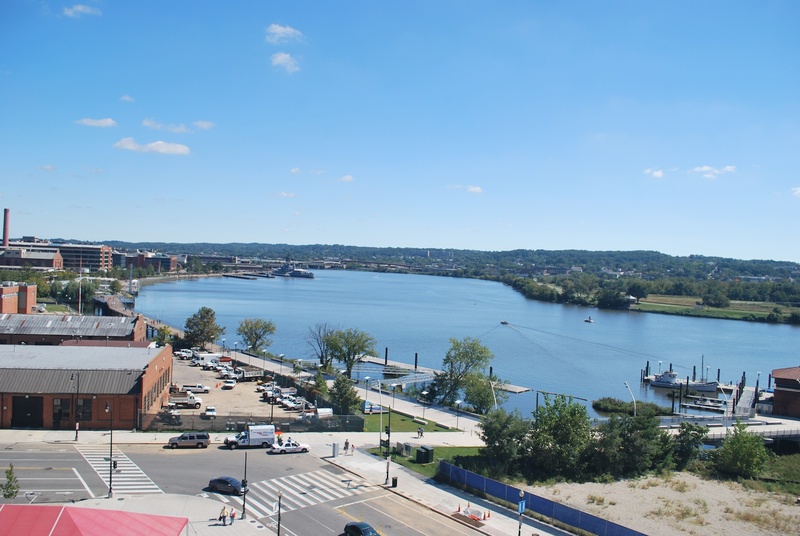 On our way down I took a picture of the Anacostia River from the ramp. 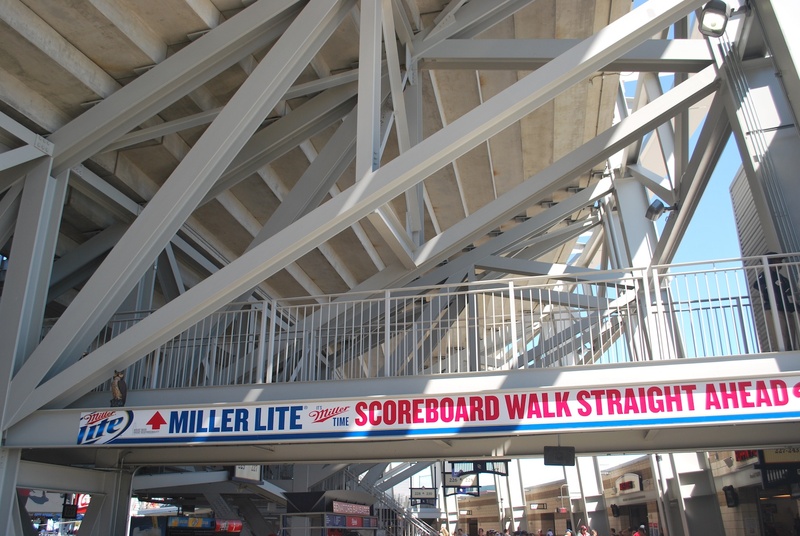 When we got down to the second level we started walking towards the right field corner. On the way I noticed an owl perched on a steel beam. WHOOO WHOOO!! (owl noises). The owl is right above the Miller Lite logo on the left side of the picture. It’s to keep pigeons from perching on the beam which is a good thing because I could see people getting surprises in the beer as they walk under. Kyle (who had me on the field on Friday) had suggested Shake Shack so I had been craving a shake since Friday. After looking at the menu I asked the worker if the “concretes” were drinkable with a straw (I should’ve known they weren’t). He thought about it and then said yes. I went with that but then as he handed me the ice cream creation (with a spoon in it) he said “oh, I guess it isn’t. I was going to just take it but another worker saw what happened and gave me a chocolate shake. I tried handing back the ice cream but she said to keep it. That was very nice of her but what was I supposed to do with two desserts? My uncle Jon (who doesn’t really eat sweets) had half of it, so it wasn’t *completely* wasted. 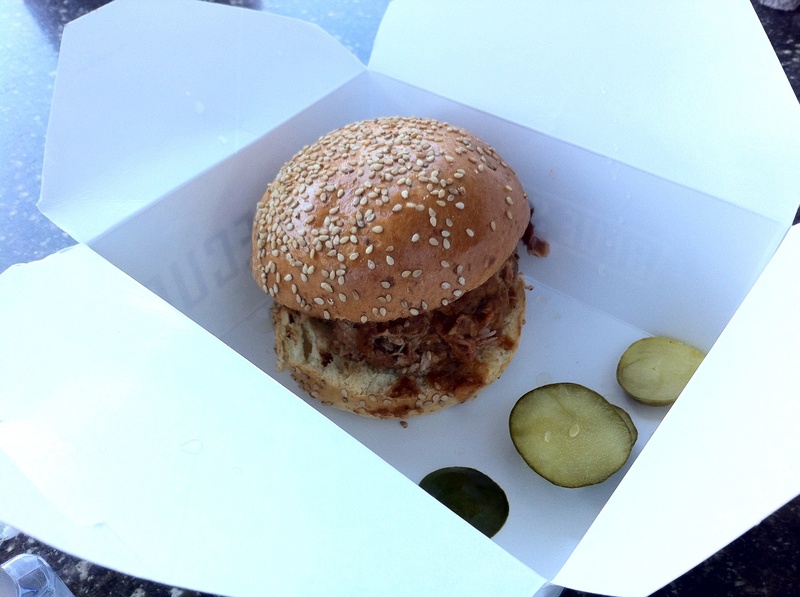 I also got a pulled pork sandwich from Blue Smoke and I was a little disappointed in the sandwich’s size. I should’ve put something next to it so you could scale the sandwich. It was $8.75 so I guess I shouldn’t have been expecting a monstrosity of a sandwich. 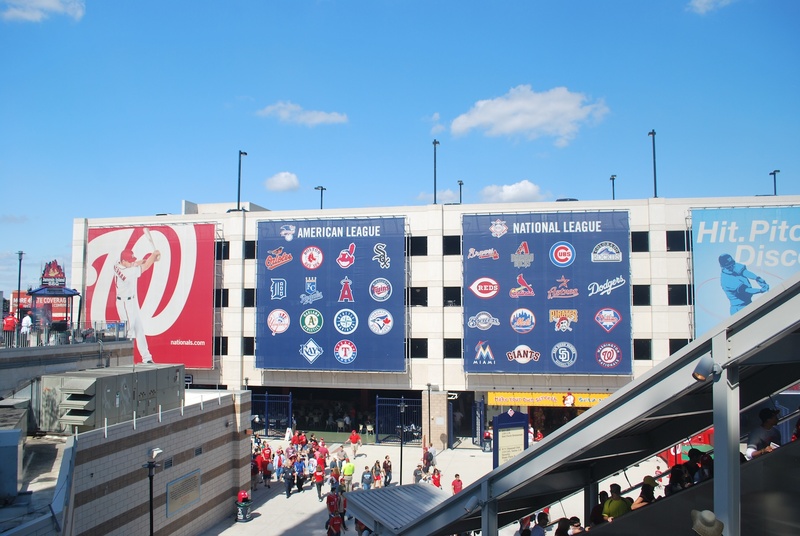 On our way down to the field level I noticed all the MLB team logos on the side of a parking garage (in case you forget). Jon and Candy had seats in section 107 and mine was in 114. I told them that I would let them know if there were open seats around me so we could sit together. I got to my seat in time to see military members on the field to greet the players when they came out to start the game. The starting nine came out and shook hands with them, I assume signed a ball, and then the military members hustled off the field. Very nice, Nationals, very nice. 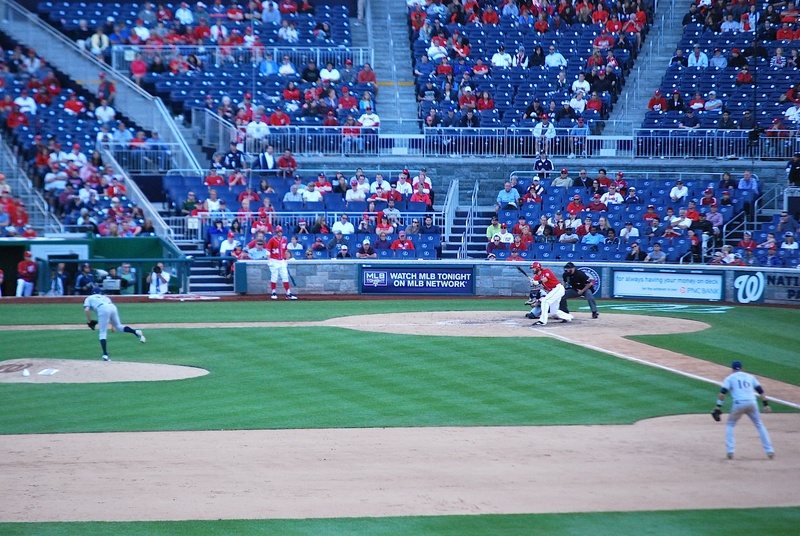 Shortly thereafter Chien-Ming Wang threw a strike to Aoki to get things started. 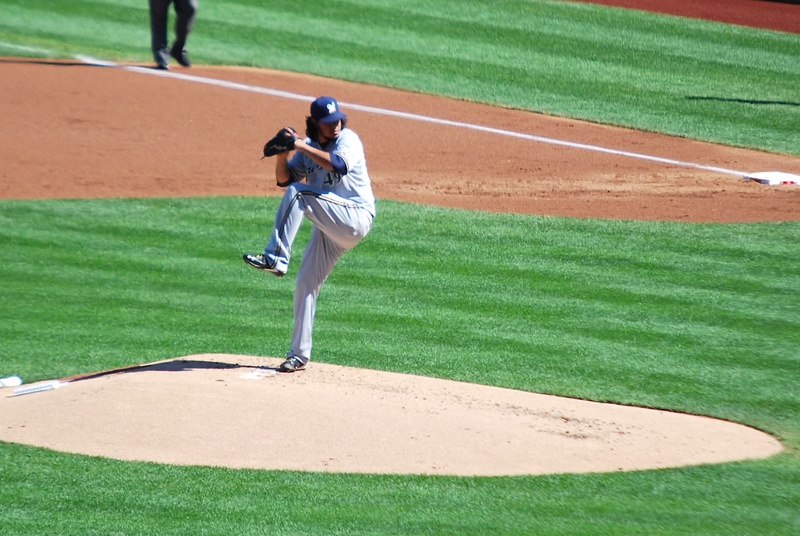 Yovani Gallardo got the start for the Crew and here is right before releasing the first pitch of his outing. The game was scoreless going into the top of the 4th and Braun led off the inning by flying one to centerfield. I think the ball is out of the frame. If not then I just lost it, kind of like Bryce Harper losing it in the sun. 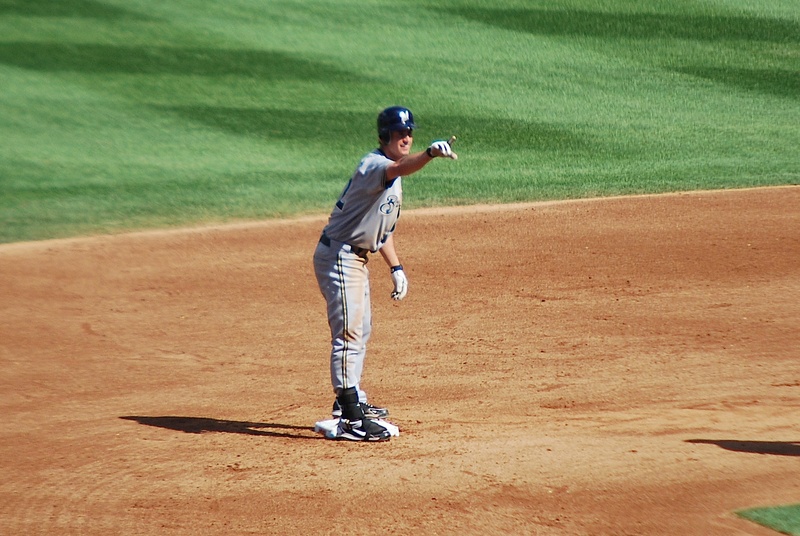 The ball landed a few feet from him and Braun wound up at second with a gift double. 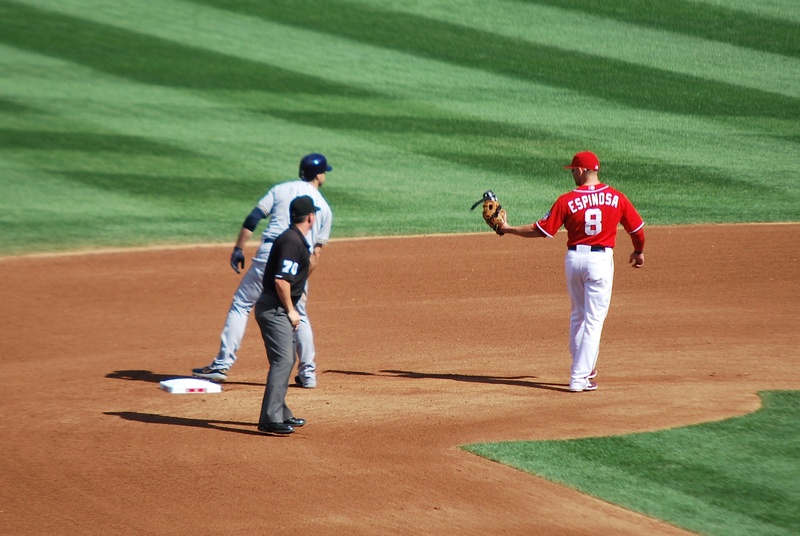 Danny Espinosa, the Nationals’ second basemen, was nice and took Braun’s ankle guard over to Garth Iorg at first. Sometimes the umpires do it, sometimes the player and coach meet halfway. Aramis Ramirez flew out and Corey Hart singled, moving Braun to 3rd base. Lucroy was up next and he singled to right field, driving in Braun and giving the Brewers a 1-0 lead. Logan Schafer had gotten the start in centerfield and he followed Lucroy with an RBI double. Atta kid!!! The Brewers had runners on second and third with only one out but failed to push another run across in the 4th. 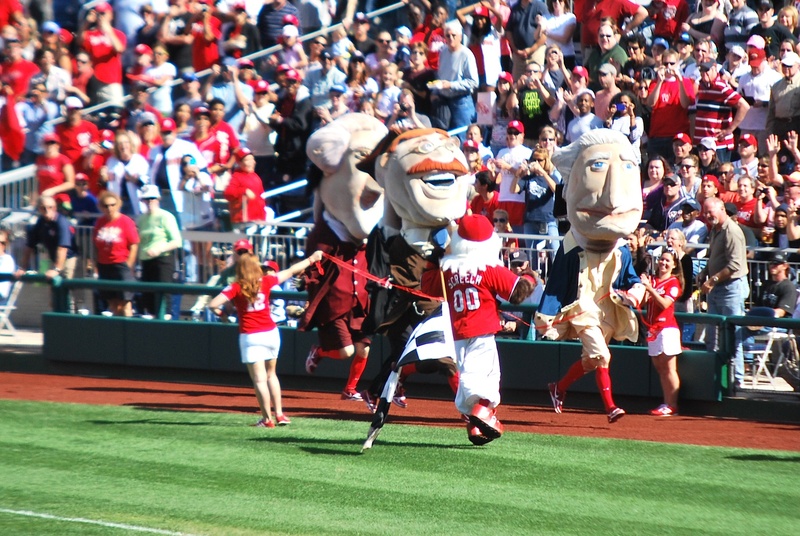 In the middle of the 4th Teddy Roosevelt *almost* won the Presidents Race. Oh the humanity!!! 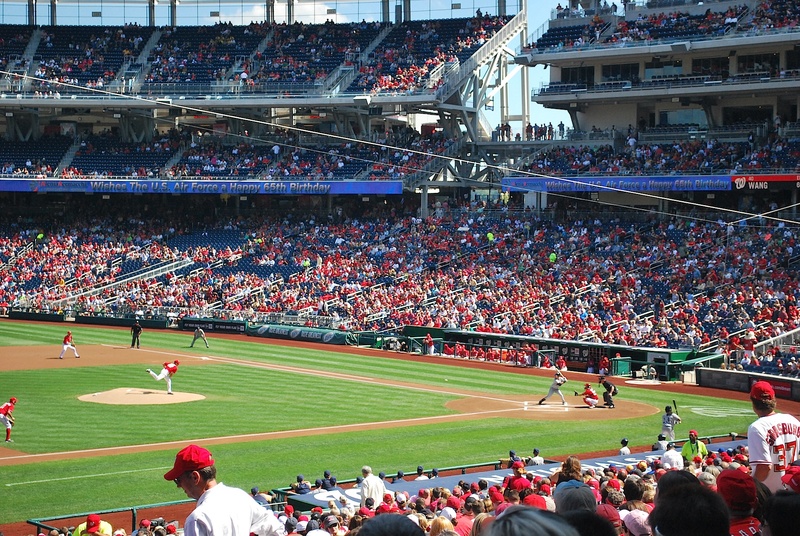 The Brewers’ 2-0 lead didn’t last long and the Nationals scored two runs in the bottom of the 5th. On Friday and Saturday I saw a beer vendor using a contraption to slice off the tops of beer cans. This of course made it easier to pour the delicious goodness into cups for serving. I thought it was cool but think it’s even cooler now that I learned he invented the inspector-gadget-like device himself. I met up with John, a former coworker’s husband’s colleague who works in DC. I picked up my ticket for Monday’s game (he said he should be able to join me) and we talked for a bit. I brought it up and John told me that the guy invented it himself. Awesome sauce! 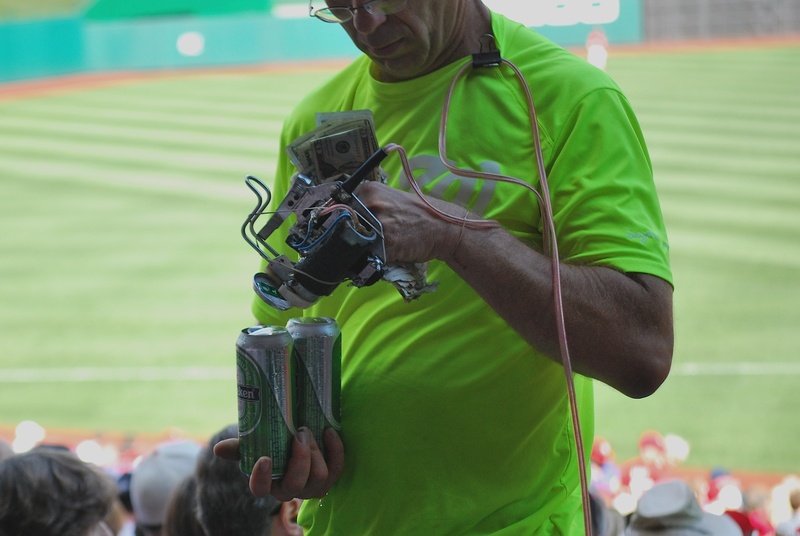 He clips the device onto a can of beer and then I’m assuming pulls a trigger that starts the slicing process. You can see it takes the very top of the can right off, allowing him to quickly poor the can into a plastic cup. I don’t know how much time it actually saves but if nothing else it should get him more sales because people want to see the thing in action. Well done, sir, well done. The game was tied at two as we entered the top of the 7th. 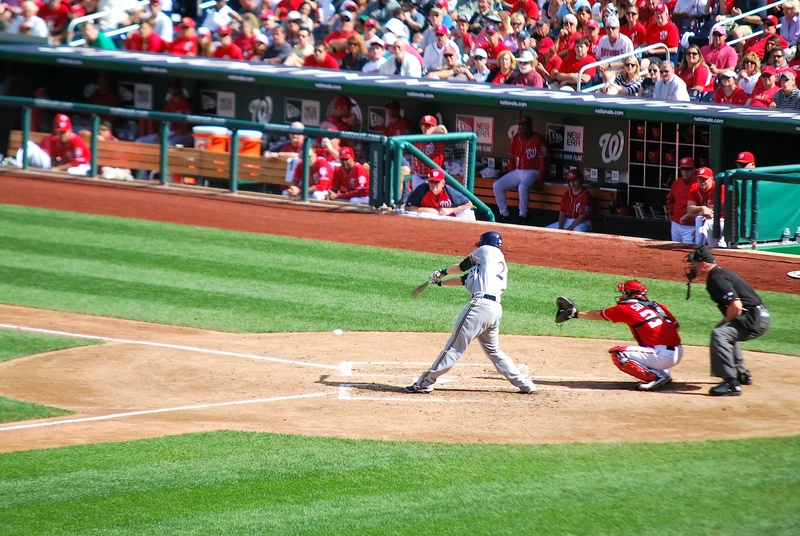 The Brewers scored three runs and two of them wouldn’t have scored if the Nationals’ right fielder hadn’t lost a pop up in the sun. Thank you sun for the assist on Sunday. I didn’t take any pictures of the action because I was meeting up with Jon and Candy so that we could sit together. I didn’t miss any pitches but I was up in the concourse and then getting situated when the runs were scored. Braun added a sacrifice fly in the top of the 8th inning. 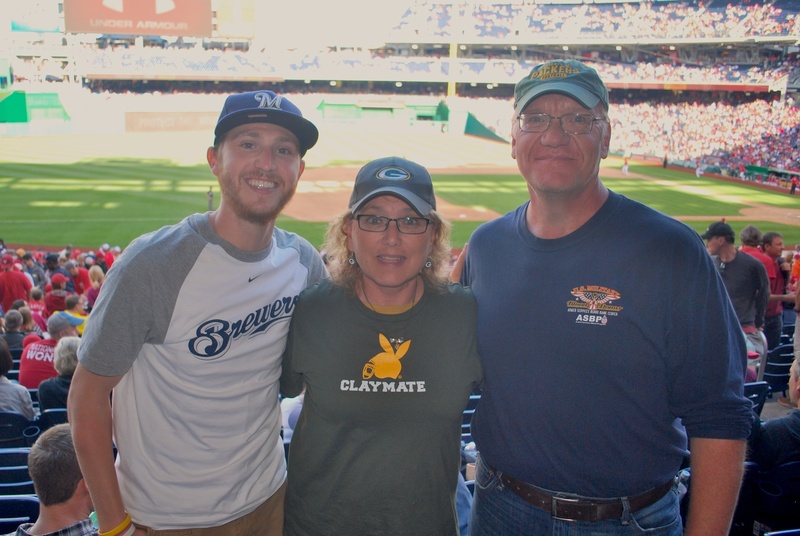 Between the 8th and the 9th I had a fan a few rows behind us take a picture of me, Candy and Jon. Jon isn’t a huge Brewers fan because he didn’t live in Wisconsin very long, and some of those years Milwaukee didn’t have a team. He is a big Packers fan though, and Candy has adopted them as her team as well (i.e. the “Claymate” shirt). I can’t thank them enough for letting me stay at their house for four nights. Thanks Jon and Candy! For the bottom of the 9th we walked over to the left field corner so we could exit right after the last out. Veras came in becuase it was a 4-run lead and not a save situation. Veras retired two of the four he faced but he walked the other two. The second walk brought the tying run to the on deck circle, so Roenicke went to Axford since it was now a save situation. Axford came in and threw four pitches, the last of which was lined to centerfield where Carlos Gomez made the catch. If you’re curious the ball is three rows above the W in “Watch MLB Tonight on MLB Network”, just to the right of the lady in red with her arms crossed. Brewer win! Brewers win! 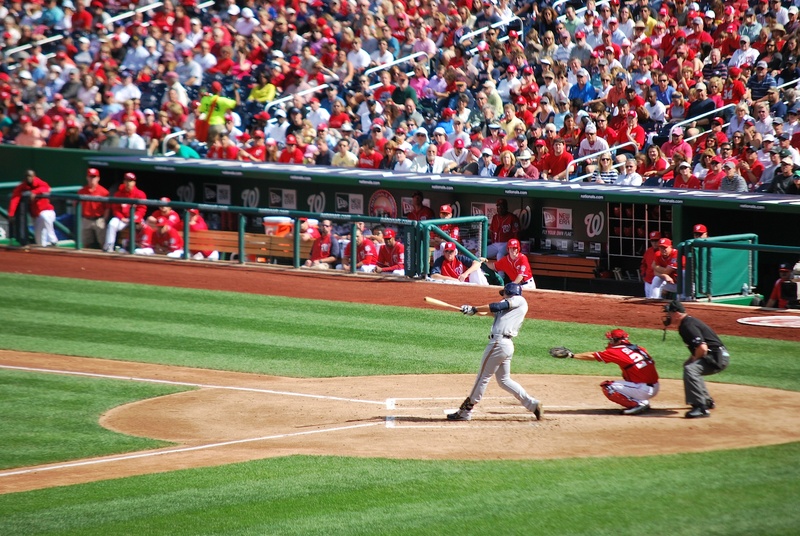 Final score: Brewers 6 – Nationals 2. The Cardinals beat the Cubs 6-3 so the the Brewers still trail St. Louis by 2.5 games. The Cardinals have three at the Astros and then finish up with the Nationals and Reds at home. Hopefully both the Nationals and Reds will be trying to get the higher seed for a potential NLCS showdown. Having the second seed might be better this year since the top seed will be going to the wild card game winner’s park for the first two games of the NLDS. Go Astros! and Go Brewers! I’m driving to the Forest Glen Metro stop on Monday and then taking the train in. After the game I’ll return via the train and then start my 8-ish hour drive to Cincinnati. 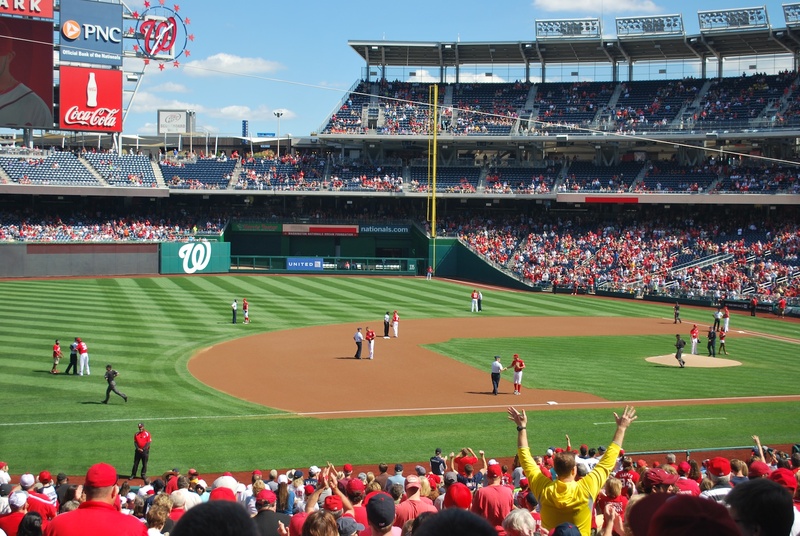 The second seed will be going to the 3rd seed for the first two games of the NLDS. So the top seed still is better.